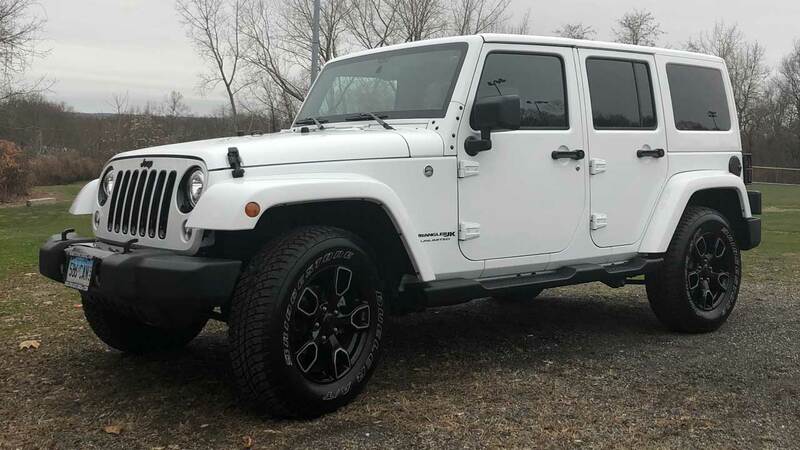 In a previous post I wrote about the 30 plus year desire to own a Jeep and I am extremely happy to report that on Saturday, November 24, 2018 I drove off the Executive Dodge Jeep of Wallingford Connecticut dealership with a 2018 Jeep JK Wrangler Unlimited, Altitude Edition. It’s like the whole chain of events leading up to the purchase was orchestrated to get me in a Jeep Wrangler, not just any Jeep Wrangler but the EXACT model I wanted in every way. I was treated very well by Brandon Brown the sales manager and more importantly my salesman Rich who as it turns out lives a street a way from me. I got what I wanted for my trade in without a hassle and the price of the new Jeep was fair and priced where it should be. Am I happy? You bet! In fact happy doesn’t begin to describe how I feel about my beautiful Jeep. So Why an I writing about it here on PixelHiker.com? A few reasons, first off I’m very excited, who could blame me, right? I mean how often does a guy who lives a meager existence get to buy his dream vehicle? Well my dream vehicle is a Pagani Zonda or Huayra but that’s an impossible dream so I’ll live happily proud with my jeep wrangler. More importantly though the Jeep fits my outdoor lifestyle. I mentioned in my earlier post that I was a pickup truck guy all my life until two years ago when I bought my Nissan Murano. When you own a 4 wheel drive pickup truck that long you take a lot of things for granted. Things you may not realize until you no longer own a truck, things like being able to head out in snow, drive off-road road, carry a lot of gear and even simple things like parking on the side of the road. Many places I like to go and photograph nature or ride my mountain bike require I park on the side of the road. When visiting these places with the Murano I learned really quick that I didn’t have the required ground clearance for the for the bumps, rocks and branches that I typically encounter. The Jeep Wrangler in many ways exceeds the abilities of my trucks for my needs. While I will always miss the ability to carry a load of lumber, a sheet of plywood or a piece of furniture the fact is those needs are once every year or two and are not valid reasons to own another Toyota Tundra. On the other hand the Jeep gives me a smaller footprint, natively better off road abilities, plenty of storage in fact with the rear seats folded down it would be quite possible to sleep in the back of the jeep. I really can’t state strong enough the importance of a 4×4 will have to my photography. Lastly the my Jeep is just simply fun to drive there is no utilitarian or soccer dad feel to it. The jeep begs you to head out when others would be staying put, it also encourages to take paths you might not explore otherwise. To me my Jeep completes me and is perfectly suited for a guy who loves to photograph nature, hike, fish, mountain bike, camp and drive around with his dogs head hanging out the window. The other thing with Jeeps is rarely do owners keep them stock. Jeeps are meant to have lift kits installed, bigger wheels and tires, heavy duty suspensions, strong bumpers with winches and many lights. While I won’t go crazy with these things because the jeep is my everyday driver I will do some upgrades to it and I will document them here on pixel hiker. I realize others visiting this site might be similar to me and find the jeep content interesting or entertaining. I should also mention that my partner on this site Erin also has a Jeep, an Oscar Mike Edition so it’s safe to say a lot of our content will include the jeeps.